Forty years and counting, Piper’s predictable, perennial, perpetual Archer begins its fifth decade as one of the world’s best institutional trainers. If you believe what more and more folks in the travel business are saying these days, we’re headed for a pilot shortage—or perhaps we’re already in one. Analysts suggest the travel industry will expand by about four percent a year for the foreseeable future. That means an insatiable need for pilots, which, in turn, translates to new opportunities for flight training academies. ATP Flight School, headquartered in Jacksonville, Fla., is America’s largest civilian aviation training facility. Organized by a group of airline pilots in 1984, the initial goal of the school was to provide transition training for military pilots completing their obligation and making the move from turbine military aircraft to commercial airliners. Later, the company expanded its flight curriculum to include ab initio training from zero time to Commercial and CFI in a specified period and a given number of flight hours. The current parameters are 280 hours of flight training, including 40 hours in Seminoles, and a commercial license with multi-engine, CFI and instrument ratings, all in six months. That total also includes 50 hours of simulator time. Total price for the training: just under $60,000. ATP also now offers a variety of courses that will train from beginner or intermediate level to whatever ratings and license a student wishes, including a jet type rating (in a Citation 525), CFII or anything in between. As ATP’s training profile has matured, the school has expanded to some 38 locations around the U.S. to provide simulator, classroom and/or flight training. ATP’s flight schools are positioned from Seattle to Fort Lauderdale, New York to San Diego and all major points in between. Back in the 1980s, ATP initially selected Cessna Skyhawks as the primary trainer of choice, but recently, the company has been replacing its Cessnas with Piper Archers. When the Archer was designed and offered as Piper’s mid-priced, fixed-gear, single-engine model back in 1974, the company couldn’t have known about the upcoming Seminole being introduced to replace the Twin Comanche. But Piper’s foresight in designing the panel and interior of the Seminole as similar to the Archer as possible was to serve them well. The Seminole’s panel was a virtual copy of the Archer’s, and that has endured to the current models. Pretty obviously, the twin-engine Seminole flies with two of everything the Archer offers in single-engine mode. Also, Seminoles feature constant speed props and retractable gear. With its recent move toward an all Piper fleet, ATP currently has about 100 Skyhawks remaining in its single-engine trainers and another 55 Archers online. The plan is to phase out the remainder of the Cessnas and replace them with a total of 100 Archers by the end of this year. In a sense, Piper CEO Simon Caldecott foresaw the expansion of Piper’s training role as early as 2010. At the time, the Vero Beach company was attempting to boost sales of its M-class (Mirage/Matrix/ Meridian) models, but the 2008 recession put that on hold. Upscale models simply weren’t selling well. Caldecott correctly predicted the need for a more viable Piper trainer, and the Archer was the perfect candidate for production out through the 2015/2020 timeframe. Caldecott fostered the continuation of Archer production and the creation of a less expensive version of the PA-28-181 targeted specifically at flight training. ATP already operates the world’s largest fleet of Piper Seminoles for advanced trainers and multi-engine operation, over 100 at last count, and that helped drive the decision to switch to Pipers exclusively for the school’s basic trainers. Michael Arnold, ATP’s director of marketing, explains. “We’ve been operating Seminoles for 30 years, and we feel we know the airplane pretty well. Many of the later models even have the Garmin G500 flat panel display,” said Arnold. “More than coincidentally, the Archer TX comes with the G500 as standard equipment, so if we re-equipped with Archers, students stepping up to one of our post-2012 Seminoles would already be familiar with the avionics and feel right at home with the panel. That’s a major advantage, since it represents one less system students need to learn. If all airplanes in the training fleet feature the same basic functions and operating capability, students are less likely to become confused when they step up from fixed gear to retractable and single-engine to multi-engine. Fortunately, there was almost no down side to re-equipping with Archers. 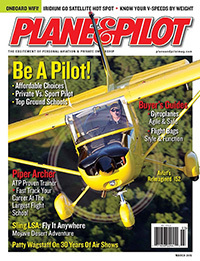 “From useful load to climb and cruise,” Arnold explains, “both the Piper and Cessna trainers offer nearly the same performance, and both are beloved by at least two generations of pilots. In the chart on the next page is a rough summary of the similarities and differences of the gas-powered airplanes, ignoring the more expensive turbodiesel versions of both models. Though the two models are near carbon copies in performance and specifications, their differences in configuration couldn’t be more divergent. One parameter that may have served the Archer well in the competition between Cessna and Piper is the latter’s low wing. As much as many student pilots love the Skyhawk, they’re sometimes frustrated by the inability to monitor traffic and keep the runway in sight all the way around the pattern with the high wing interrupting the view. Drop the inboard wing for the base and final turn and, in many cases, you’ll lose sight of the runway threshold. You may also lose contact with other traffic. The Archer is also arguably easier to refuel (if not preflight), with the wing just below waist height. Many instructors feel the Archer has a gentler stall and more forgiving landing characteristics, as well, as the wing is flying in ground effect, creating a cushion of air to soften the touchdown. The Skyhawk is also amazingly docile at the bottom of the envelope. You can argue high-wing/low-wing advantages and disadvantages and simple stall forever, but one of the major benefits of the Archer from ATP’s point of view is simply that it’s a Piper and therefore similar to a Seminole from the outset. ATP boasts 14 regional airline alliances with commuter carriers such as Envoy, Republic, Mesa, Trans States, Express Jet, Ameriflight, Sierra Airlines, Air Choice One and 135 operators for even more job placement avenues. These allow a limited number of top graduates of ATP’s professional pilot program to be interviewed for possible entry-level positions. As flight crew requirements increase over the next few years, there will be greater demand for ATP graduates. In the meantime, ATP also occasionally hires its own graduates as primary CFIs, instrument CFIIs and multi-engine CFIIM instructors. For better or worse, the FAA recently muddied the waters by raising the minimum Part 121 copilot requirement to an ATP rating and a jet type rating. By definition, that means 1,500 hours total time. Applicants are also required to complete the ATP Certificate Training Program, above and beyond the standard ATP written test. Previously, first officer applicants were required to have only a commercial certificate with instrument and multi ratings and the prerequisite 250 hours total time to be eligible to occupy the right seat of an airliner. The new rule also includes provisions for allowing certain pilots under special conditions to earn “Restricted Privileges” ATP ratings until he or she obtains the necessary flight time and can fly with an unrestricted ATP license. A Restricted Privileges ATP allows the following aviators to receive the modified certificate: a) a pilot younger than 23 with less than 1,500 hours; b) a military pilot with 750 hours; c) a Bachelor’s Degree graduate with an aviation major and 1,000 hours total time; d) an Associate’s Degree graduate with an aviation major and 1,250 hours; and e) a pilot 21 or younger with more than 1,500 hours. In addition, all applicants for the ATP must now have 50 hours multiengine time. Revised regulations stipulate that copilots on airliners must have a minimum of 1,000 hours as first officers before they can make the move across to the left seat. Still, the rewards of a successful airline career can be worth the expense and effort to reach the peak of the pyramid. Though it’s true that entry-level salaries for commuter copilots are barely above subsistence wages—about $35,000/year after considering $10,000 signing bonuses that are now common. Pay increases to over $100,000/year at the majors, and tops out well over $200,000/year for senior captains. Check AirlinePilotCentral.com for up-todate pay scales. Major heavy captains and even senior low-cost-carrier captains such as Southwest can achieve this in today’s environment. Plus, for the first time in decades, pilots who start training today have a greater certainty of reaching the majors faster than ever before. Airline salaries are based on aircraft weight and speed and seniority, so the first two parameters have been pretty much fixed for the last two decades. Who knows what manner, weight or speed of two, three or four-engine jetliners pilots will be flying in the 2020s and 2030s, but the compensation very well may make an investment of $60,000 in training seem minuscule by comparison.